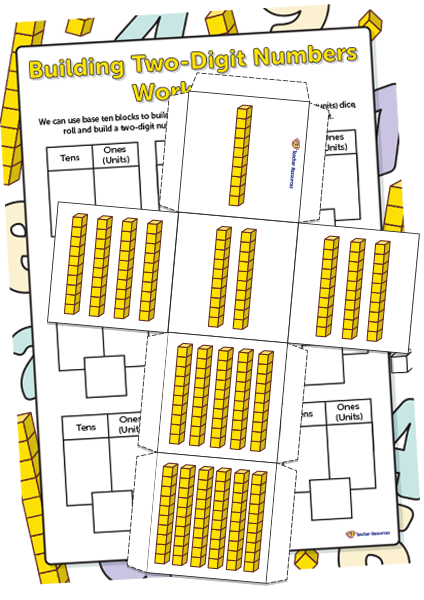 A fun way to explore the use of base ten blocks to build two-digit numbers. Ideal to use in the classroom when learning about place value and two-digit numbers in small groups. Select and download the full colour or black and white version of this resource. Print, cut and assemble the tens dice and the ones (units) dice. Ask the children to roll the tens dice and the ones (units) dice. Ask the children to record the number that they have generated in the correct place on the place value worksheet. What comes next? – use the blank dice template to draw tens blocks 40-90 and ones (units) blocks 4-9, and explore number up to 99. Thank you! These are great and I can’t wait to use them. Thanks for that feedback. We hope you enjoyed the resource! So pleased you’re finding the resource handy.